From time to time, I thought it might be fun to look back and re-post something from the archives. Since it's January, and cold, and snowman weather, I'm looking back to 2010, when I shared this project to build a snowman! This is a pattern that you can use for sewing, applique, embroidery or even cutting and pasting. Or a combination of those. So, download the pattern, and get started! 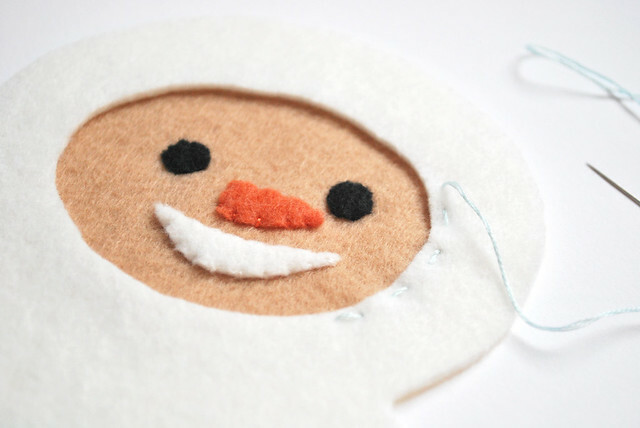 Cut out a face (from the second page) and stitch or applique on some features. 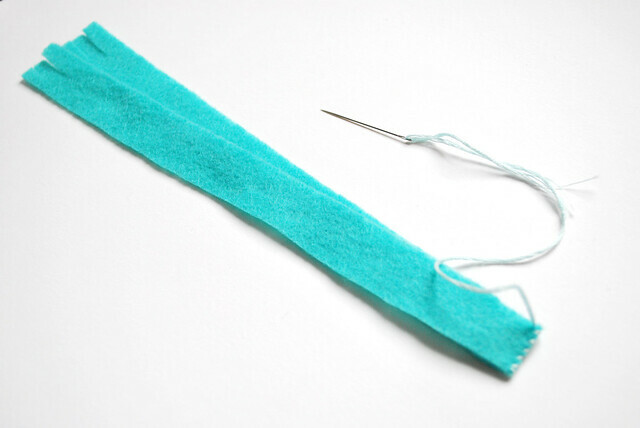 Using a running stitch, sew the face behind the opening in your front body piece. To your body pieces, add on any other details. I went with simple buttons, which I stitched around first, then attached with the french knots. The button, heart, bow, flower, coal or necklace are good items for adding on at this point. 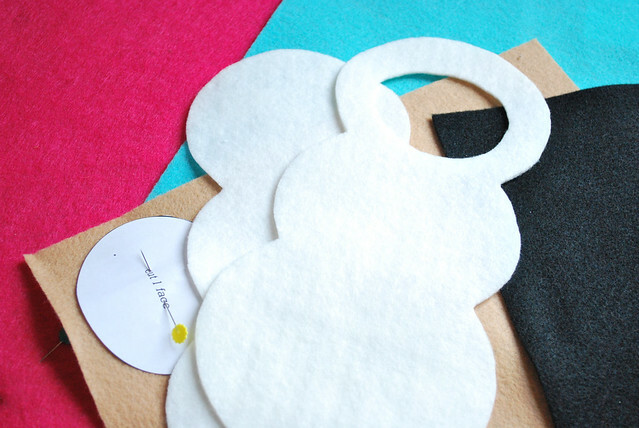 For these, just cut around the outside of the shape, and add stitched details. 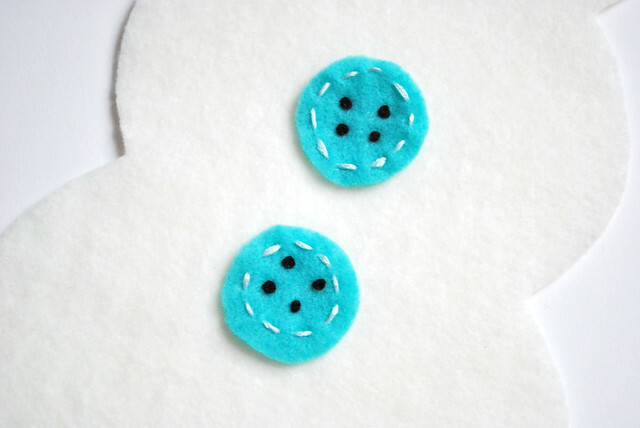 Or you can simply embroider them on, and skip the extra felt pieces. Once you've attached these things, sew the two pieces together, leaving an opening. 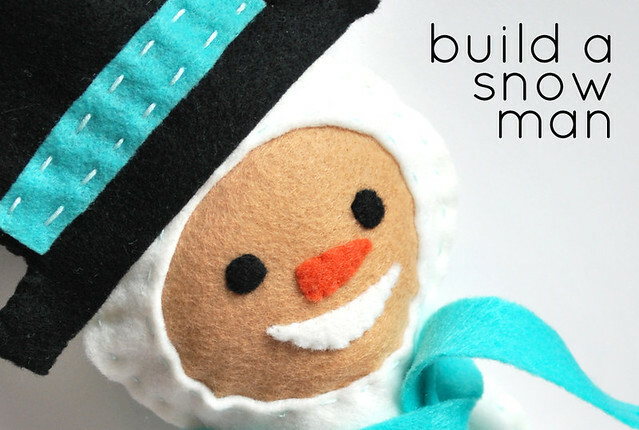 Fill with stuffing, and then stitch closed. Of course, I forgot to take a picture of this process. I was just too excited to finish him up! Now, make some removable accessories. I stitched two scarf pieces together, and fringed the ends. 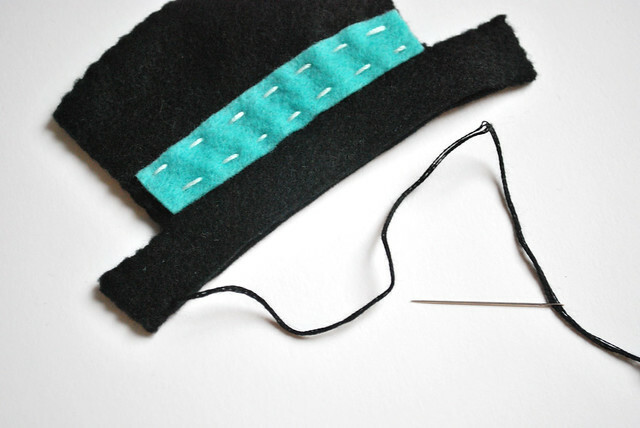 And I attached a hatband to one hat piece, then sewed around the two hat pieces. You can sort of see where I stopped here to leave an opening for my snowman's head. And he's done! 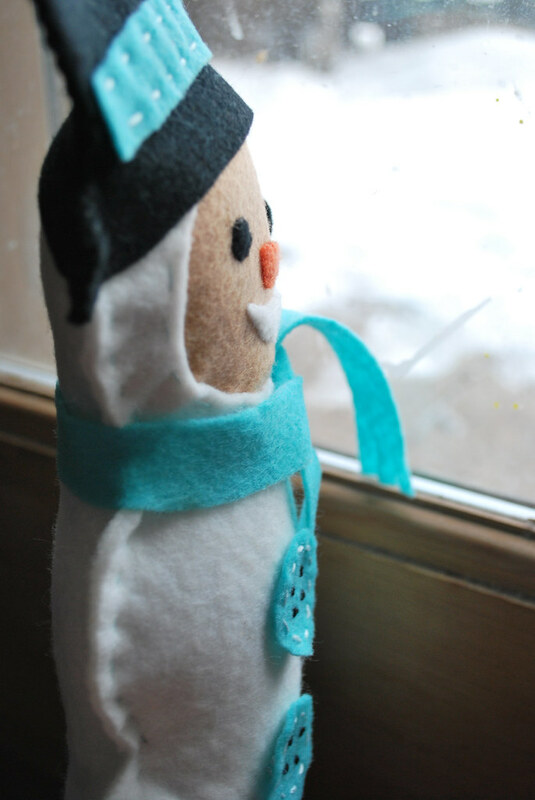 I told my sister, I hope I don't seem vain, but I love this little snowman! You can also make an apron that has real ties to hold it on. Just cut out the outer apron shape, add some details if you like, and stitch some yarn through the top of the apron, leaving long ties. Or you could tack on some ribbon. Of course, there are lots of other things that you could add...that's the best part about something modular! To use this as an embroidery pattern, just shrink it down. Or if you have little ones who like to cut and paste, print out some pieces and let them go to town like my sister did! Have fun, and if you make one (or a whole snow village) of Steph's Snowman, please add your picture to the Wild Olive Flickr group! This makes me go "Awww!" Very cute, and I love how you made it look like a little kid in a costume. 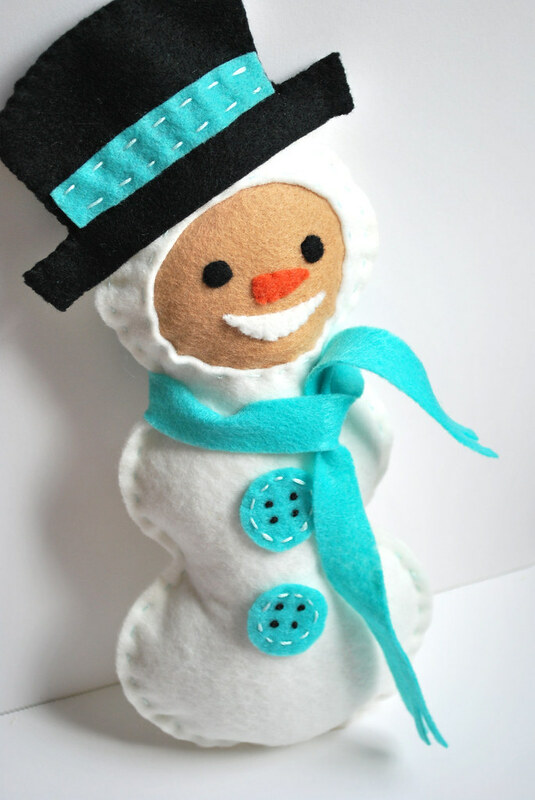 That turned your ordinary snowman into a unique creation. Thank you so much for this post. I want to let you know that I posted a link to your blog in CBH Digital Scrapbooking Freebies, under the Page 7 post on Jan. 13, 2012. Thanks again. AW! I love this so much!!! You really are one of my role models as far as crafting goes. You make the cutest stuff and each piece has so much heart. Thank you for that!!! Makes me feel a little bit cooler - thanks! Ohhhhh it's very nice!!!!! Kisses! que monadaaa!! es super cukiii!